What shamans have discovered over millennia is that our Dreamtime can open the portal to more rapid healing, guidance from the “higher” levels of reality, direct connections with ancestors, and more. Amazing possibilities can open when we learn how to become active and conscious in our dreams. That’s why I’m thrilled to be able to connect you to a free event featuring Robert Moss, the bestselling author of Dreaming the Soul Back Home, Dream Gates, and 13 other books on the transformative power of dreams. Robert is a very beloved teacher of mine. Robert is a brilliant and fascinating teacher on this subject, opening up a real paradigm shift in how you view your dreams and your soul, and how they can guide you to courageously follow your “True North” to your heart’s deepest desires. Discover advanced shamanic dreaming techniques to journey into other realms (including the afterlife) and receive wisdom and inspiration for your life. I feel I know enough of death and conditions on the Other Side to help others gain first-hand experience of the greater reality without the extremity of a near-death experience. You will be challenged to go beyond your previous limits, and brave up to your personal Death, but you will travel with a veteran guide under the blessing and protection of higher powers. This is at the heart of the way I seek to teach, by opening doorways for direct experience of the sacred and the many worlds: ways to see and remember who we are, where we come from and what our greater purpose is, in this life and beyond this life. Access guidance and healing as you learn to connect with those on the other side and dissolve your fear of death to live with greater ease, passion and love. Have you yearned to “part the veil” that separates our world from the afterlife and make direct contact with departed loved ones? If you could actually have that experience, how might it change your perception of death… and life? What fascinating new information, guidance and support might you receive? These do not need to be speculative questions. 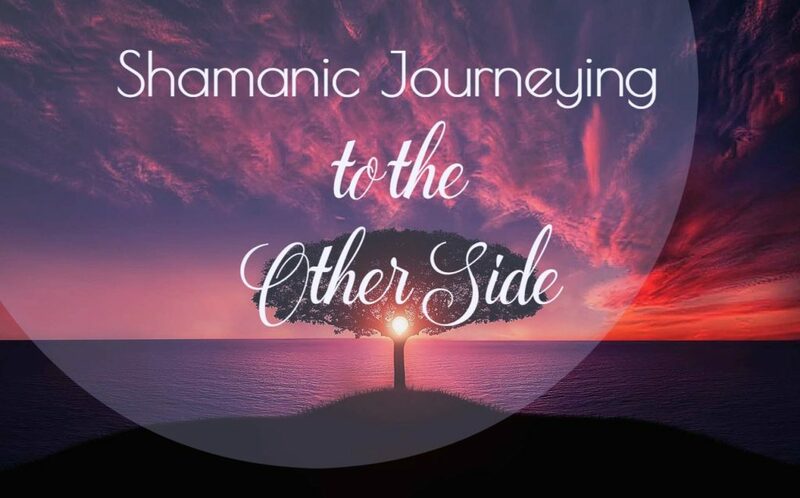 Around the world, shamans, lucid dreamers and healers have pioneered a powerful, valuable and fascinating way to cross the threshold between worlds — a way of using shamanic journeying to visit other dimensions. Engaging in such voyages in consciousness can result in deep healing of unresolved emotions and profound openings to a more expanded understanding of reality. It can also help to free you from the fear of death. People report profound feelings of peace after contacting departed loved ones, as well as inspiration and wisdom to engage in life more fully. This is because they discover that healing and forgiveness are actually available across the apparent barrier of death. Yet, what happens after death is far too important to rely on secondhand accounts or hand-me-down beliefs. We need firsthand knowledge. And, we can obtain that knowledge by visiting realms where the dead are alive, and by receiving visitations from those who have departed this world. Both ways of knowing may be accessed, easily and naturally, in dreams. Opening to the practice of shamanic journeying in your dreams can turn your nights into a time for transformation, healing and receiving guidance. It’s a time when you can receive higher guidance from the “other side” that’s precisely attuned to what needs attention, nurturance, love and healing in your life. In this free online mini-workshop, you’ll have a chance to learn core principles and practices for shamanic journeying to the other side from Robert Moss, the bestselling author of close to a dozen books on dreaming, shamanism and the imagination as means to enhance and transform the quality of our lives. Robert is the creator of Active Dreaming, an original method of dreamwork and healing through the imagination which synthesizes ancient shamanic practices with modern dream science and spiritual disciplines from around the world. Through the powerful techniques he’ll share during this complimentary hour, you’ll discover how you can access the other side for guidance and healing and cultivate a particular courage and deeper sense of peace that comes with experiencing this journey. Robert will show you how to put these empowering teachings into practice — expanding your capacity to seek and receive guidance from other realms for healing and transformation — perhaps even forgiveness — you may have never thought possible. More than anything, this free call event will illuminate a paradigm shift in how you relate to death — expanding your understanding of how to open the portal between worlds as a way of gaining direct knowledge, spiritual awareness, and the courage to live your life more fully, and with more ease and joy. In short, death can become a portal to a richer life! Join us for a mind-expanding hour where you’ll also learn about a brand new training with Robert that will explore this fascinating terrain in great depth. PS – Robert Moss can help you grow your understanding of how to engage dreaming as a real spiritual practice that will guide you in finding your “True North” and living an authentic and heartful life.